Regulations regarding flammable storage and the storage of combustible liquids are in place in order to keep you safe and compliant. OSHA has regulations in place in order to keep the public safe and protected. When looking for a flammable storage container it is necessary that it meets all OSHA, NFPA, and EPA regulations. Our experienced professional engineers can custom-fit your flammable storage container to your exact requirements. 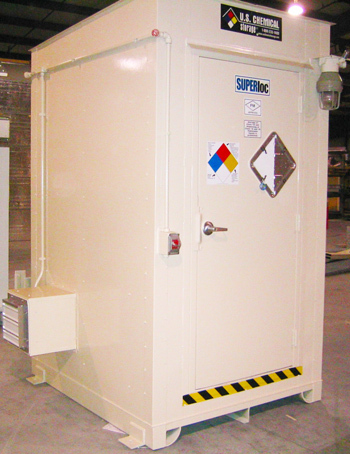 Our flammable storage buildings meet and exceed all OSHA flammable storage requirements. The unmatched strength of our flammable storage buildings provides security for all of your flammable chemicals or combustible materials needs. Constructed from fire resistant gypsum wallboard for extra strength and increased fire-rated construction. All of our chemical storage buildings are hand-welded from heavy-gauge steel and offer superior durability and design. Built to order so your customized flammable storage building enables you to store any type of flammable chemicals inside your flammable storage building, while meeting all OSHA flammable storage requirements. Explosion proof accessories are available for storing combustibles or flammables and our fire-rated buildings can be designed for either 2-hour fire rated or 4-hour fire rated. Choose from the 2-hour fire rated FIRELoc flammable storage building or the 4-hour fire rated SUPERLoc flammable storage building for your new chemical storage needs. Bot the FIRELoc and SUPERLoc meet all OSHA flammable storage requirements, NFPA regulations and EPA regulations. Both products can be tailored to meet FM Approvals or Warnock Hersey standards. When storing flammables, it is commonly necessary that climate controls are utilized inside the flammable storage building for complete safety measures and 100% compliance. Mixing and dispensing rooms are available to mix and dispense your flammable storage in a safely manner. Our mineral wool insulation and multiple layers of fire-resistant gypsum wallboard are UL Classified for superior construction requirements and rated to meet and exceed OSHA flammable storage requirements. Make your facility 100% compliant and keep your investments safe and protected with a flammable storage building today with US Chemical Storage.